Cryptocurrency Trading, Buy Bitcoin, Ethereum and Ripple. Australian Regulated Broker. Cryptocurrency Trading, Buy Bitcoin, Ethereum and Ripple. Australian Regulated Broker. Bitcoin is the king of cryptocurrency and the most recognised coin. Trade Bitcoin’s movements without needing to purchase a single coin. Ethereum is a smart cryptocurrency supporting smart contracts. It’s the largest cryptocurrency next to Bitcoin with a strong commercial reputation. Ripple is classified as a centralised cryptocurrency in a very decentralised space. Ripple is positioning itself as the cryptocurrency for banks. A cryptocurrency is a digital or virtual currency designed to work as a medium of exchange between two parties. It uses a technology called Blockchain to secure and verify transactions. Although cryptocurrencies are digital currencies which operate independently of banks and governments, they can still be transacted, exchanged, bought, sold and speculated on, just like any physical currency. Cryptocurrencies are able to be purchased through unregulated overseas exchanges which can present some real risks to your asset purchase. However, trading cryptocurrency CFDs through easyMarkets presents a safe alternative option for trading for profit without the risks attached to unregulated exchanges. What is the difference between trading cryptocurrency CFDs and buying cryptocurrency? Using traditional exchanges, you can buy them in the hope of selling them at a profit. However, this process is complex, requires you to buy an actual coin amount at market value, and you only make a profit when you sell and someone else buys your coin off you. In a falling market, this strategy may fail if you can't sell your coins. Trading with easyMarkets CFDs allows you to purchase a market position on a coin at market value, without actually owning the coin. Instead of having to sell your coin to make a profit, you can simply close your position effective immediately. A buyer of your coin is not required, and you can walk away with your profits in seconds, rather than waiting for a buyer to purchase. This highly recognised currency was the first out of the gate and leads the cryptocurrency world with pride. It is managed to ensure a limited supply of Bitcoin is produced, with a maximum quantity of 21 million Bitcoin units ever to be in circulation. With such a limited supply, it is easy to see why its value has skyrocketed to make it the highest value coin available. When it was introduced, the price of 1 Bitcoin was less than 1 cent. Its current value is just over $9,000 USD per coin (as at May 2018), and it's easy to see why this coin has made so many millionaires. As the concept of blockchain advanced, the focus turned to more application capability for cryptocurrencies. Ethereum was founded and became more than just a currency – Ethereum can respond to sophisticated requests called smart contracts. Its ability to process agreements between two parties automatically, without any middle-man intervention gives Ethereum an edge on Bitcoin and has attracted attention from banks around the world. This, among other factors, has led to a price jump of almost 1000% in 2017! Ripple can be described as a next generation payment network. It was originally set up to engage financial industry institutions, with instant payment transfer capability. This digital currency has been a leading technology and has exploded over the past year. Ripple has been in discussions with major banking institutions as an alternative to the traditional SWIFT payment transfer systems currently being used for monetary transfers globally. Why trade cryptocurrency CFDs with easyMarkets? Unlike other cryptocurrency exchanges, you can make money in both a falling and rising market by trading cryptocurrency CFDs. easyMarkets pioneered dealCancellation, where you can cancel any losing trade within the first hour and recover all your losses. To protect client deposits, all client funds are separate to easyMarkets company funds and are not available to be used for easyMarkets operating purposes. We maintain sufficient liquid capital to cover all client deposits, potential fluctuations in the company’s currency positions and outstanding expenses. Unlike cryptocurrency exchanges that have a history of being hacked, your funds are safe in our accounts with no complicated wallet storage procedures or risk of being hacked. Your funds remain safe and secure in top tier, low credit risk, global banks. Only you can access your funds. No matter what happens during a trade you can rest assured that your account balance will never go below zero. Set the lowest price that you are comfortable with and set stop-loss to close your deal when it is reached. A great risk management tool, offered to you at no additional charge. Many brokers adjust their spreads depending on how active the markets are. 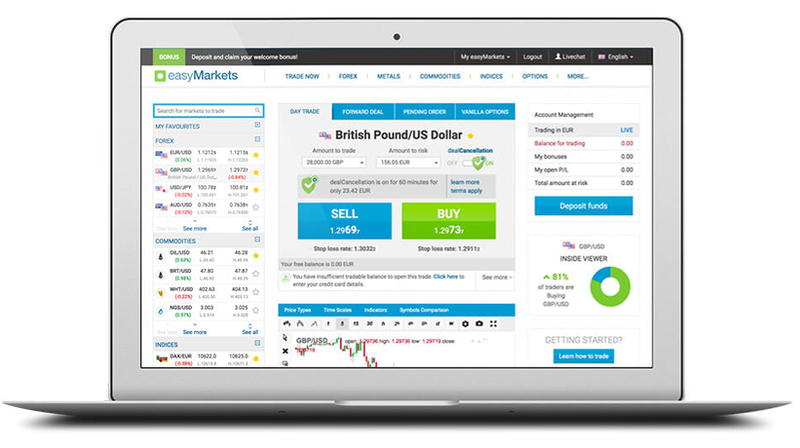 easyMarkets offers fixed spreads so you know exactly what you will pay when you trade. easyMarkets allows you to cancel a losing trading within a specific period of time for a small fee. Think of it as insurance for your trade, if you are unsure of its outcome. There's no minimum balance to open an account, it takes minutes to create, and there's no obligation to fund or trade. Open an account to experience our platform and trading features. easyMarkets Pty Ltd (AFSL 246566 ABN 73107184510) makes no recommendations as to the merits of any financial product referred to in this website, emails or its related websites and the information contained does not take into account your personal objectives, financial situation and needs. We recommends that you read the Regulation Page, The Product Disclosure Statement, the Terms and Conditions and the Financial Services Guide before making any decision concerning easyMarkets products. 2018 © easyMarkets Pty Ltd (formerly known as easy forex Pty Ltd) ABN 73 107 184 510 and is regulated by the Australian Securities and Investments Commission (ASIC). Australian Financial Service (AFS) License No. 246566.
easyMarkets Pty is part of Blue Capital Markets Group (Blue Capital Markets Ltd is not regulated by the AFSL and ASIC).